Found this online, which explains the same conditions we are experiencing, called whuffing. chimneysweeponline.com/howhuff.htm They also talk about other draft issues chimneysweeponline.com/hodraft.htm and air inversion being one of them. Knowing what that is, I can say that I see that occasionally. EDIT: To get a quick, clear idea of what we are experiencing, scroll down to March 3 and view the video. In particular, the puffs of smoke at the 18 secs mark, and the explosions at the 53 secs mark. This is a video of our Harman wood stove. They provided some tips on wood drying, blocking airways etc. They then refered us to the local dealer. We emailed the local dealer yesterday, waiting to see if they reply. All day yesterday we were very mindful of the fire, it had exploded once yesterday. Last evening we went to bed and the damper was shut with the draft set to half open. Mid way through the night we woke up with the heavy acrid smell of smoke in the air. That GD thing was exploding again. We had to turn the air exchanger on to max to clear out the house. This morning I thoroughly check all parts and the air intake. Everything seems normal. Sparked up a fire with a few splits. Once it was going, added a few small split birch 3″ diameter split in half and let that catch before adding some larger pieces. Sure enough, BOOM. GD! Once thing for sure, this past month is the most occurances we’ve had with the explosions. Local dealer called yesterday and we discussed the issue. He says a draft test should be performed. Waiting now for their dealer to call and see if we can diagnose the problem. Local dealer called this morning. They spoke with Haram who indicated the problem might be ‘over drafting’. They require a draft test needs to be done, if the gauge shows over .08 then there is overdraft situation. The dealer also spoke about environmental conditions such as negative pressure in the house; bathroom fan going, dryer vent going, stove exhaust fan going. We rarely turn on the bathroom fan. We do not use a dryer, we have one, just don’t use it. And our overhead stove fan exhausts back into the room, no external vent. Dealer talked about outdoor conditions; barometric pressure drops, location of fireplace exhaust vent and wind that passes by the location causing unique situation. The thing is, the wind is typically calm when these explosive events occur. Dealer says air is being pushed into the firebox, I think its being pulled in but I’m open to explore all solutions and possibilities. Local dealer called, who said they’d have company call. No one has called. Since then the stove is performing a little better, still get the occasional whuffing (mini explosions). Most bad experience with this Harman wood stove. Uploaded a video to youtube. This clip is 26 min long. We’re having a lot of draft issues with the stove. It performed just fine during the day, burning around 500-600F. Using birch and maple. At about 10:30 PM, it started to act up. Nothing changed in the environment (temps, winds). We had cleared the door lass the day before but its covered in soot again over the top half so its a bit difficult to see everything that is going on. 06:42 – I opened the damper to try and clear out the stove and clear the glass. 18:00 – I had put in text that says “Finally..it calmed down.” but that’s not correct. I might have to upload the vid again. 19:00 – Bigger plumes of gas, I got closer to the stove. Big balls of flames. 20:00 – Decided to open the damper and draft. Opened the door. Smoke coming from the black pipes. Closed the door, smoke still coming out. Fire raging in the box. 21:10 – Stove wide open, window open nearby. Smoke still coming out of the black pipe. 21:35 – Closed the damper. Smoke STOPS coming out of the black pipe. Weird! Only way the fire will stay in control is damper closed and draft wide open. From that point on, I slowly closed down on the draft until it was 1/4 open. Flames slowed and coals cooled enough to say it was safe. Went to bed. Draft and damper open to get the fire started. And lo’ and behold, smoke coming from joints in the chimney. So, what the hell? Fire not hot enough to push the smoke up the chimney? How the hell else is a fire suppose to be started? NO MORE FIRES until someone can tell me what’s wrong. Another snapshot from today. The explosions prior to the camera rolling set off the fire alarm in the house and lifted that top trap door a full 3 inches. My dear wife, sitting 5 ft away nearly had a heart attack from fright when it exploded… not once… but twice. Mar 03 2012 – Having to take care of the poor draft issue on the Harman Oakwood fireplace, we were recommended by local dealer to install one of those spinning wind caps. This is our video of that installation. This is an Excel model cap made in Canada by ICC Industrial Chimney Company Inc.
Mar 26 2012 – Update: Well the stove is still exploding. The chimney cap has helped a lot but the ‘wuffing’ of gases and explosions in the firebox of this Harman fireplace (Oakmwood model) is still occurring. May 08 2012 – Update: Gases still are not clearing properly. Some wuffing still occurring. 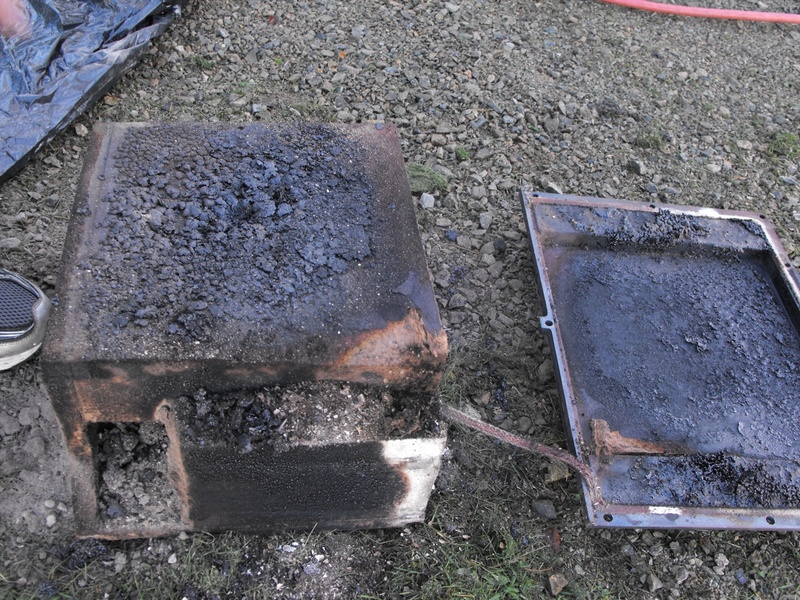 A user, t0rr3sfamily, on Youtube posted the following “My friend has this problem (same stove) when windy outside. I say it’s a draft problem rather than stove problem.” at http://www.youtube.com/watch?v=ibeQsoiK58c Other youtube users posted similar comments on this video. I just found your video and corresponding posts. Thank-god I found what you wrote. I have the exact same stove and the exact same problems! I have owned this piece of crap stove for a year and I have tried everything to alleviate the issue. I just lit a fire last night for the first time and again I experienced the huffing/puffing with this stove. So frustrating., Smoke in the house! Can we talk about how you solved the issue? Thanks. Some people were commenting about the temp gauge we are using on the stove. Pictures are below. This is the one from last year. Before we do start fires this year the unit will be replaced. I don’t know if that’s necessary or not, but there’s always a bend in the probe due to heat I guess. So I always start with a new one. Today I had the local refrigeration repair at the house, John Besaw is his name. He promptly diagnosed the problem with our fridge and we moved onto the subject of burning wood. He asked me how much wood I was burning and I began to tell him the story of the difficulty we have with this Harmon Oakwood. Having burned wood all his life, he was curious. John enjoys puzzles apparently because he took the time to listen to me and ask questions. He narrowed down his focus to the secondary burn, and the stove’s inability to burn off the excess gases. We went the stove as he wanted to know how the stove functioned, air flow, etc. We focused on the back of the stove where we assumed there must be a secondary chamber. Back of the Harman Oakwood wood stove. We took off the heat shield (4 bolts) and there remained 5 more stove screws required an allen key (hex head). I went out to the garage and retrieved the tools and took them off, which required a little bit of effort. As we removed the rear plate, a “chamber” which looked to be made of the same liner material as inside the firebox, was attached to the back plate, we slowly pulled it all out. What we discovered was quite honestly… shocking. The chamber was almost full of creosote and ash. Come to find out the “chamber” was stuck to the back plate and we were able to separate the two. The amount of material inside the chamber was incredible. Looking at this chamber I came to the conclusion that all those small little holes, “ports” I call them, probably are meant to have air or gasses flow through them. So I gently placed a piece of copper wire in a couple holes but they came to a stop about an inch inside. As I inserted the wire towards the holes in the center, the wire went through. So, I came to the assumption that all the holes should be through and through. I poked the wire through each of them, most met with a little bit of resistance., meaning they were plugged with soot/creosote. Using a copper wire to clear the holes. Only went in about an inch. Now that the secondary chamber is cleared out, time to bring it back to the stove for reinsertion. I used the shop vaccum to clean out the right side to compare a before and after in this chamber area. This entire area is not accessible unless you take this route and do the work. No where in the stove’s owners manual do it say anything about cleaning this part of the stove, or even mentioning the necessity to clear this area. Harman wood stove manual on how to clean the stove. The last step was to put the back plate on the stove and the heat shield. On thing I did notice was the back wall of this secondary chamber has a inward bulge (dip) in its surface. I’m guessing its either an intentional part of the design or its a weak spot. You can clearly see the dip here. Harman Oakwood fire place, rear of secondary chamber (back plate removed) after cleaning it. We have yet to start a fire with the stove, now that its thoroughly cleaned out. I’m actually feeling relief and hesitation at the same time. Relief that we found the obvious fire hazard that was existing in this wood stove and a little hesitation with starting a new fire and not knowing how the stove will behave. I’ll guess and say that it will be better performing, but that lingering feeling of a bad, very bad, history with this wood stove will always linger… just like the smoke that blows out from this wood stove when it does back fire. Time will tell and I’ll be sure to continue updating this conversation as we move forward. I would like to take this opportunity to especially thank fellow Newfoundlander John Besaw, the refrigeration repair man from Antigonish, for having the curiosity and willingness to take his time to listen and help diagnose the problem. That’s far more help than what I received from the manufacturer. Apaprently this issue is nothing new with regards to the secondary chamber filling up with material. Here is a discussion I found at Hearth.com (link). That discussion thread is now closed but I started a continuation here. This photo is added today to show Justin Veysey what the air intake kit looks like. Its a black piece of metal, pre-bent to fit the underside of the back of the Harman Oakwood stove. You can just see the 4 inch duct which is the intake pipe. You will also see insulation and a black pipe covering over the duct. I did that because that duct is a direct vent to outdoors and that duct pipe gets REALLY COLD in the winter. Its now about 3 minutes later and the flue therm says 350F. We’ve run a few fires now and the stove is finally working normally. Our only wish throughout all of this experience was that the Harman wood stove manufacturer take a pro-active position in helping us solve the problem. It took the local refrigeration repair man, to whom we are very grateful. Adding this picture of the door glass for the Harman Oakwood wood stove, as part of a conversation below. Little soot after a dozen burns. Started a fire this morning. Raining outdoors, winds from the south at 24 km/hr. Barometer at 750 and falling. Immediately puffs of smoke coming from joints in the chimney. Went outside, spinner cap ok and working, smoke coming out of the chimney. Fire came up to temp, about 600F, but the stove still smoking puffs. House is now full of smoke, waiting for the alarms to go off. 2013-11-01: Harman Oakwood wood stove smoking today. 2014-11-19: Patrick Dender mentioned about making sure the ports to the air chamber line up. Cleaning out the stove today, the grate has finally disintergrated. I’ll probably have a local welder make up a new plate from high heat steel. Well, to summarize what I’ve said in past posts, I installed the stove spec manufacturer’s specs, including its own dedicated air intake. The wood we use is dried to about 16%﻿ moisture content (on average). Spinner cap installed and extends nearly 3 ft above the peak of the house. I’ve had fires going with the ash pan empty and full, doesn’t make a difference. Maple and birch is what we burn mostly. I now see I have some cleaning to do on this unit before we start burning more consistently this year. How long did the “cleaning” process take from start to finish? I imagine this is going to kill off the better part of a Saturday? The cleaning process is straight forward, once I was aware of what to do. Cleaning the secondary burn chamber, start to finish, took me 30 minutes. The chimney flue, another 30 minutes. Youtube user Arya Biswas has replied to a comment on Our Harman Fireplace Wood Stove goes BOOM! 1. Wood is not completely seasoned. 2. You damped down TOO quickly and wood is not able to sustain a burn. 3. You are measuring the temperature with a wood stove thermometer INCORRECTLY. 4. You have your house ‘too sealed’ up. 5. Excessive Creosote has built up in your chimney. If any of those are true, you can get significant downdraft and cause your stove to “huff”. You need to be careful because this CAN cause CO poisoning. If your inside chimney is double walled, you CANNOT correctly measure wood stove temp with a thermometer. It HAS to go on the stove top. Engage afterburner ONLY after you get 2 inches of coals and stove temp is atleast 400F. If not, depending on your wood and draft, it will not burn correctly. 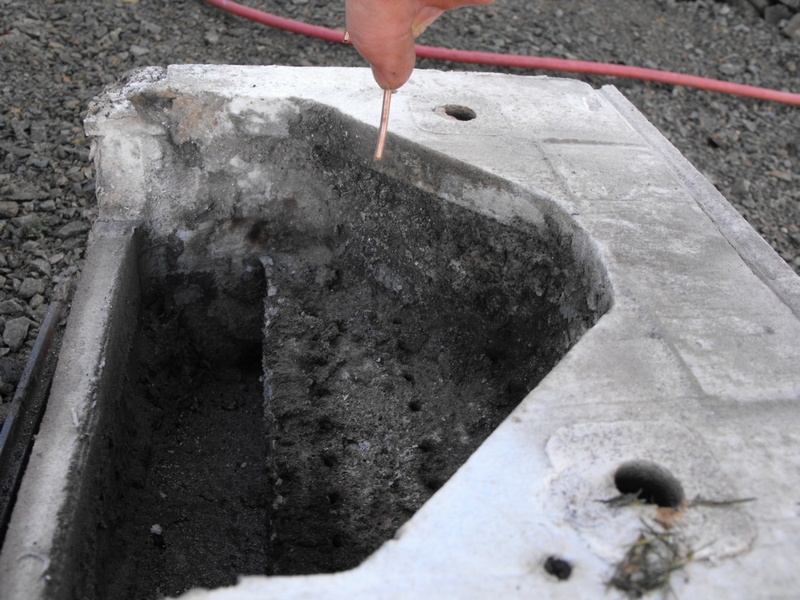 If stove still “huffs” you will need to pipe in external cold air to the base of the stove. See your owners manual on how to do that. This is for houses that are sealed in too tight. I had problems after I insulated my house/attic and insulated all doors and windows. As a result, I burn one of my Harmans extra hot and the other one can be run at a much more decent temperature. I have two TL300s. What wood are you burning? How tall is your chimney outside? How many bends? Even if you burn hot inside, you have to have your flue temperature be hot enough to rise up your chimney. Without inspecting your stove, I cannot be certain but I doubt there is a problem with your stove. Like I said, I have 2 TL 300s and they both behave differently. There is a steep learning curve to burn well with these stoves. Took me 3 years. I would bet you money that if I came over to your house, I would NOT be able to burn without getting ‘huffing’. Just takes some getting used to. BTW, I am by no means an expert on wood stoves. I just can burn mine without ‘back puffing’ or huffing anymore. Hope this helps. Wood is seasoned and moisture content is down to 16-18%. I do not damp down too quickly. Thermometer is installed correctly and the correct one for the location. The black pipe is 6 inch double wall. The thermometer is not magnetic, its the probe-type. A hole the size of the probe was measured up 18 inches from the stove top. The probe slides into the hole allowing the probe to measure internal chimney temp. For accuracy, I buy a new probe every year. The house is R-2000 certified so yes, it is sealed up. That is why we followed the manufacturer’s recommendation and had its dedicated air intake installed with the stove. So it has its own source of air. Chimney is cleaned every year and is always in good shape upon inspection. Very little creosote… except for this past year when we started having so much trouble with the stop, we stopped using it. Afterburner is automatic, I have no way to control when and if it decides to start. When it does, its normally after a good fire has built up in the stove during the day. We are burning mostly birch and maple. The external part of the chimney is about 10-12 feet. There are no bends in the chimney, it runs straight up from the stove top to the chimney cap. We gauge we do with the stove based on the flue temp. Hi Justin, I’ve added a picture above (dated Oct 01, 2013) to show the air intake. You need to try putting enough wood in this to draft the airflow up the shaft. It appears that the amount of﻿ fuel is insufficient to create the necessary updraft. Otherwise remove the stove and rep[lace with a different manufactured unit. What is your damper set at? There’s sufficient wood. If the stove does not work this season, it will be coming out and I’l replace it with my $500 Drolet wood stove that’s in my garage. By damper, you’re talking about the﻿ rear one correct? A lot of people call the sliding lever in the front a damper, when in fact the front is the draft, the rear is the damper. With that clarification out of the way, the damper only has 2 positions, full open or closed. We’ve had trouble with both, but usually when its closed. Based on your experience with the air intake package, and the fact that it did not seem to solve your problems with the stove, I am not going to invest the time or money pursuing that angle. I assume this was an add-on at the time of purchase and is another way for the dealer to charge more money. My stove does not have this package attached to the unit, and I refuse to spend any more money on this stove as it has become a bottomless pit for money and my time. 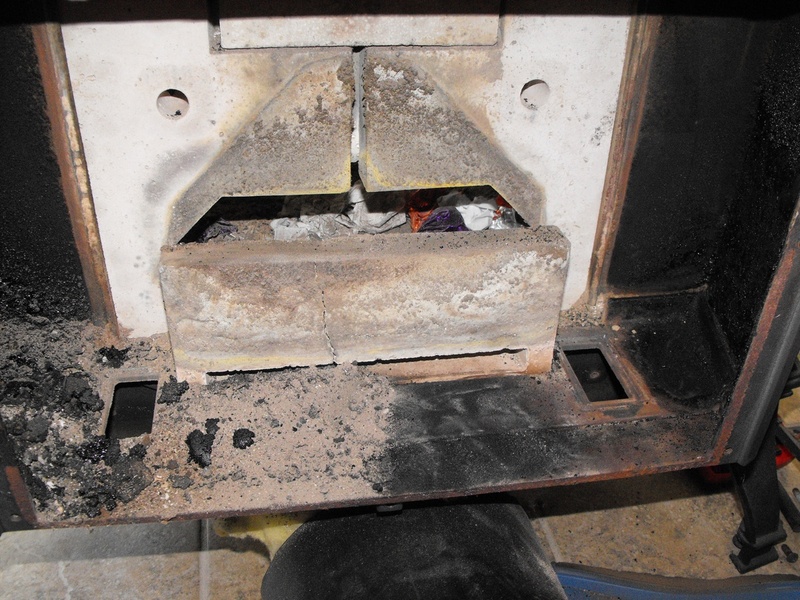 Upon evaluating your findings with your test burn after the thorough cleaning, it does not appear to have solved the issue of the stove’s ability to sustain the “sweet spot” in temperature for normal non-creosote building burning. This is frustrating. Again, it appears the ability to engage the secondary burn system on this stove is elusive and virtually impossible to replicate without a magic wand and a wizard hat. Has the puffing/huffing occurred yet since you lit the test burn today? That air intake was a part of the stove when we bought it. But if you have a small piece of sheet metal handy, just make your own. You will see at the rear of your stove, up underneath, 2 rectangular ports, that’s the air intake for the stove. All this little kit does is consolidate to a 4 inch hole for the direct intake line. Of course, there is the added work of running the line (same as installing a dryer vent) to an outside wall. I have some hope, given what I’ve gone through, and what this stove has been doing now. As I just posted, I added some hardwood and now the temp is risen to the 550F. As for right now its at 625F so I’m thinking I will have to start closing down the draft very soon to control the burn. Regarding the secondary burn, I think this only starts after a period of time the stove has been burning. With my stove here right now, I’m guessing the stove is able to burn all the gases efficiently without the need for secondary. That’s an uneducated guess on my part. I would say you start with a good cleaning, then go from there. Start a fire. If it doesn’t catch and burn well to allow you to add more wood after a few minutes, first try opening a nearby window to improve air flow. If that’s the solution, then either continue doing that, or put in a direct vent. I know exactly how you feel Justin, truly do. And up until I discovered and cleaned out that secondary chamber, I had no hope for the stove. I think the blockage in the secondary chamber might have been the problem. Seems logical. Started first fire after thorough cleaning. Added pics. With little to no wind outdoors, the wood stove seems to be providing good draft. Added 3 pieces of hardwood about 7-8 min ago, flue temp now at about 550F, damper closed, draft still wide open. No winds outside, just a steady rain at 15 C.
The stove performed very well. It threw heat really well, too well actually, as the air conditioner kicked in 🙂 So I shut the ac off and opened a few windows. There was no whuffing at all. Other than the occasional adjustment to the draft it went very well throughout the evening. WOW!!! It seems Harman should include a chapter about cleaning the burn chamber and secondary package in their manual. So, if I’m hearing you correctly, the stove was able to maintain an even temperature in the desired burn zone for the duration of the day/evening? Congrats Jim – I hope to be able to report similar results next week on this forum! Yes, the stove behaved very well. 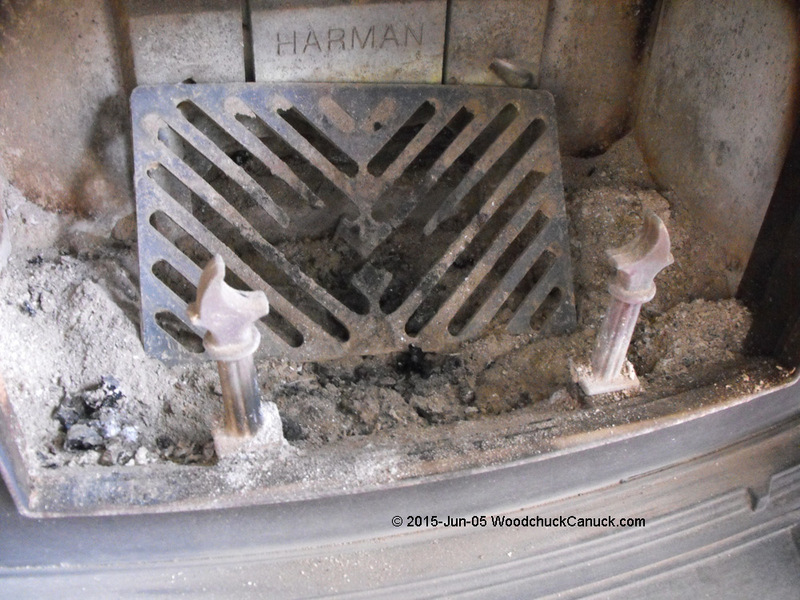 And also, yes I agree that Harman should have a clear section on the parts of the stove that need cleaning. I have been watching the videos on your wood stove, AKA, Boom stove. Just wondering if the problem has been resolved? In my opinion, it seems to be a “draft” or “air flow” problem. 1. I would pull the pipe and make sure those joints are resealed or replaced. If you have an air leak on an upper pipe joint, it will drastically reduce your draft. It may be a major air leak in the transition box. 2. Have you ever checked to see what your stack temperature is? If you are losing the heat into the room, then the cooler pipe, in addition to an air leak, you will lose draft, thus causing the boom effect. 3. To see if you have a pipe leak, plug the top of the chimney, toss in a few smoke bombs and see if the pipe is leaking air somewhere. As they say, wheres theres smoke…. If air is leaking into the pipe, it will reduce the draft at the stove tremendously. I am not a stove dealer of any sort, never have been. I am just trying to offer free opinion help. (ha) Sure you are getting enough of that! Good luck and stay safe with that stove. Thanks for your post, none of your suggestions were the problem. Problem solved already. If you go to the summary page for the Harman Oakwood wood stove problem http://woodchuckcanuck.com/2011/12/18/our-harman-fireplace-wood-stove-goes-boom/ and allow the pictures to load first, then scroll to the section on September 30 2013 you will see the discovery and solution. I hope you continue to enjoy the fruits of your labor with the Harman and the newly cleaned out secondary burn package. I cleaned out my secondary package last week in similar form to what you describe here, but I continue to experience the extreme drop in temperature (according to an external thermostat I have on the exterior of the stove). I did a test burn on Saturday after a thorough clean out of the chamber where I did discover a significant amount of ash/creosote build-up. It was not excessive, but there was some. More over, I discovered a pretty beat up secondary burn package here. The styrofoam material that it appears to be made of was in an extreme case of degeneration and much of the debris I found and vacuumed out was this broken down material. In fact, the material was so worn the suction of the vacuum blew a hole the size of a quarter in one spot near the holes I cleaned out with a small piece of copper wire. Yikes! I did not remove the rear panel of the stove from the back of the secondary burn package due to the fragile state of the burn package. I didn’t feel the need to at the time, but given the problems that continue to persist, perhaps I should of. What do you think? No where in their manual does Harman state an ideal range of operation for this stove, and everybody seems to say different things who have this unit. Any thoughts? My test burn yielded an extreme amount of smoke pluming from the chimney outside. Do you have similar experiences with yours? I have always been told that if you are burning wood correctly, there should be very little smoke outside. When the stove was wide open, I brought the external thermostat up to around 525. After shutting the stove down and lowering the control on the front and center of the stove, the temperature dropped to around 290, and it stayed there for the duration of the burn. My thermostat indicator thing says this is burning in the “creosote zone.” As soon as I shut the stove down, the nice fire we were enjoying and watching through the glass disappeared and all we had for the rest of the duration of the fire was a smoldering mass of wood smoking in the firebox. What is the point in having a wood stove with a beautiful glass door where you can’t see the fire as soon as you shut it down? It just chokes out. I can’t continue to burn this stove like this. I am open to any and all suggestions. I hoped cleaning out the secondary burn chamber would be the solution, but this stove is still not functioning correctly. It should not be this hard to run this stove! What is an ideal temperature to bring the stove up to before shutting it down? Where do you leave the front level when you do? Do you move to half way? Less? More? Can you still see a flame or fire when you shut yours down or does it disappear? How much smoke are you getting outside when the stove is shut down? Any data for the following would be great. I have burned the stove twice more since my initial test burn, and the results have continued to be the same. 🙁 Too much smoke, inability to maintain an even hot burn, and the disappearing fire that turns to a smoldering mass of smoke (a clear creosote forming no-no). I am left wondering what to try next. Thanks for thinking it over. If you did not open the back of the stove, I don’t see how you might have been able to completely clean out the secondary burn chamber. I monitor stove temp based on the thermostat I have in the flue, 18 inches up from the stove top. I don’t trust the external gauges. Anywhere between 400 and 600F seems sufficient. Even the gauge says “normal” being in that range. I didn’t look at what was coming out of the chimney on the first burn after cleaning. I was more focused on the stove’s performance. The occasions I have been outdoors while the stove was burning resulted in very little smoke. Did you clean your chimney too while cleaning the stove? If you are still getting a lot of smoke in the box after the fire has started my assumption would be there is a problem with airflow in the unit. As I said before, you need to take a look at the secondary chamber in the back of the stove. When the stove gets to 600-700F I closed the rear damper, but leave the front draft wide open. The fire remains burning well and you can clearly see that air flow is good (fast flickering flame). If the temp stays at 600 or so (anything over 700 is bit hot), wait a few minutes and then close the draft about 1-2 marks. The temp will drop, maybe to 450 F or so. But at some point usually within 30 minutes or so I notice the temp starts to get hotter. So I continue to slide the draft 1-2 marks. That’s near half way at this point. The stove can burn steady at this time. Prior to cleanly the secondary chamber, the glass was always covered in soot. Now there’s only a little bit of black soot on it even after about a dozen fires (see picture above). So that means its burning correctly in my books. My only suggestion left is to open up the back of the stove and pull out the secondary chamber. If its as fragile as you said, you might need to replace it. Maybe it was damaged in transit. See if the dealer/manufacturer would replace if that’s the case. **Edit: Add on – Justin, you might want to also check the draft lever is functioning properly. Its up underneath in the front. First open the ash pan door, then get down and look up underneath wile sliding the draft from right (open) to left (closed). When in the open position, there should be a wide opening (at least wide enough you can put your 4 fingers up in it). I have a direct air intake, so I can easily feel the air flow since its cold outside. If you side the draft to the left to close the draft, you should only see a small hole (drilled into the steel by the manufacturer). If you need pictures I’ll see what I can do later. I may have not communicated correctly before. I took the entire secondary burn chamber out as you did, but I did not take the metal back plate off that has the manufacture’s guidelines for installation etc. on it. My stove does not have a heat shield on it as your does. Was there build-up in between the secondary burn chamber and the back plate when you took things apart? I will check the draft lever when I get in from work today to determine its condition. I believe it is fully functioning. I will move the thermostat to the pipe (although it is not a probe like yours) to see if that helps. I will also replicate the process you described in terms of shutting the unit down in stages. p.s. The chimney was fully cleaned out professionally this summer and he did a good job because I went up with him and examined the results. If you look at the picture captioned “separating back plate and chamber” you will see the buildup. Its not thick, since there is very little space between the iron back plate and the back of the burn chamber. I can’t recommend the thermostat being on the outside wall of the pipe being accurate, especially if the pipe is double walled. After following the procedure for shutting things down, can you still see a fire/flame burning inside the firebox once you have closed it down? Yes, fire burns very well. I have a pipe thermostat identical to the one in your pictures, but I do not have the probe to insert in the middle and into the actual pipe. I may hunt one down and drill a hole into the pipe to better use the gauge. I also have an external thermostat I place on the top of the stove as well. I thought the pipe gauge worked well last night, but unfortunately when I got up this morning it was still stuck in the same place where it had been last night. The stove pipe is not totally flat as it rises up from the surface of the stove and makes a slight angle to feed into the chimney flue. As a result, it gets stuck not being on a totally flat surface. I had slightly more success last night with keeping a fire going (visually) in the firebox when I followed your prescription for shutting things down. I still have too much smoke coming from the chimney for my liking. It suggests to me I am still not in the sweet spot for optimal burning. When things are shut down and the stove is operating “correctly” do you hear a whirring (almost wind blowing sound) coming from the stove? I have been told this is the sound the secondary burn chamber makes when processing the off gases. It is almost like a dull purring noise a light low wind would make. Have you experienced that? Does this description of sound familiar to you? I wouldn’t worry too much about the amount of smoke coming out of the chimney. Just so long as the fire is burning ok, you should be alright. Regarding the sounds from the secondary burn, yes, I have heard that occasionally. Its like a low roar of a jet plane (for lack of a better way to say it). Did you have to drill a hole for internal probe for pipe burn indicator? Yes, you have to drill a hole through the pipe wall to insert the probe. Drill it the same size or 1/16″ larger. Better results with last night’s burn. Able to sustain a flame/fire. Although I would prefer for the stove to be able to maintain a higher operational range after shutting it down, it is still within the “best operation” zone albeit on the lower end for both the surface indicator and the stove pipe indicator. Depends on what you mean by ‘shutting down” I guess. When I think of shutting down, I would expect that to mean closed damper and closed draft. We started a fire this morning and had it going for about 8 hours. We let it heat up and then let it simmer with damper closed and draft half closed for the remained of the day until the wood burned itself out. I’ve never yet closed everything completely. The shutting down I am referring to is identical to the procedure you just described. I have mimicked the process you suggested I try in an earlier posts. Today Nov 01 2013, started a fire in the Harman Oakwood wood stove. House full of smoke. Check the updated comments to this post (with pictures). Sounds like temperature inversion to me. We have experienced it several times when the temperature outside is warmer than the temperature inside the house. There does not need to be a severe difference in temp for this to happen. The smoke has difficulty rising as it normally should and instead leaks out of all cracks/seams in the stove. Let me start off by telling you I was about the pull the trigger on one of these Oakwood stoves or a TL 2.6. But after seeing your videos I don’t know. I grew up with a Mark I coal stove and it worked great but whenever we had down pressure it would smoke like hell. Luckily this only happened twice in the 15 years my parents have had it. But we really loved that stove and the construction of it, but now I am having second guesses about a Harmon in my home and instead putting in a 1980’s good ol Heritage wood stove, there is no combustion chamber to get in the way. Is there any way all of the combustion chamber can be remover and ran with out on the Oakwood? Kind like a straight piped vehicle? Have you tried another stove to see if the Oakwood is the problem? Anyways if you could get back with me with your thoughts I would appreciate it. The stove work snow, but it took the discover of the plugged secondary chamber on the Harman Oakwood stove to clear up the issue. I can’t make any recommendation about circumventing the secondary chamber. I would never recommend doing a hack job to any wood stove. 12/2013 First season with TL2.0 what a nightmare. Same problems smoke and boom booms. Now I never shut the draft down. I have no confidence in the stove. After the holidays I’ll check and clean that secodary burn chamber although I haven’t even burned a cord of wood in the stove. Dealer wants nothing to do with me and is no help. That tells me he knew the stove was a problem before he took my $2200.00 plus tax. This site has been helpful and I’ll keep tinkering and never will I tell anyone to buy a Harmon. They do not stand behind their product! Jim’s right. It will probably not totally alleviate the issue, but cleaning out the secondary burn chamber greatly helps. I followed Jim’s lead on this, and I have had more improvement for this year’s burnings as a result. I also recommend not emptying the bottom ash pan but once a week. Let the ash build up. This has helped prevent extra unwanted air in the fire chamber which had also exacerbated the ‘boom’ issue for me. Finally, the only way to get one of these stoves to perform even half way decently is to study and experiment with your burnings in order to eliminate any other variables in the equation. I have been using this stove for almost three years, and no two fires in it behave the same way. There are numerous factors at play here- some machine related (stove), some chimney and/or flue related, some wood related, and some environmental (weather etc.) For these which I can control, I do and it has helped to isolate the specific problems with the stove’s questionable design and inability to properly process off-gases from the burning process. I wish you the best of luck in studying your unit. Operating one of these properly can be very tricky. For what its worth, I don’t empty the trash pan. When I started with the stove at first, I would empty the ash pan. But the bed of coals would get really hot, making the metal grate (that separates the ash pan and main chamber) glow red, to the point the grate started to warp. So, no more dumping. About once a week is all I need to empty the ash in the main chamber. Mine did backfire twice the other night but that was shutting it down too quickly after loading it. Always a learning experience. Other than that, the stove is working good now. I have been burning this stove for four years now, I have studied and researched and tested this problem as well… What I have found is its nearly always due to the wood… Mainly the moisture. I have had great success using wood that is very dry… 8-12% anything with more moisture than that has proved to be an issue, and creating smoke. When your creating smoke, you are also depositing creosote. Looking at your prior photos of the after burner, severe creosote is visible, I can only say that your wood must be way to wet. When wet wood steams out, it cools the secondary chamber and forces it to burn out allowing creosote to deposit. Also your afterburner is fractured and no longer serviceable. These things are extremely delicate and get damaged by over firing, those temps look like they have been very high…mine looks nothing like that after 4 years running… My wood guy always brings me “seasoned wood” LOL it has like 15-20% moisture in it when I test it with moisture meter. So I now buy my wood from him (Cheap) a year before I plan on using it. This stove needs DRY WOOD! If you see any smoke out of the chimney, your after burner is not active… When you don’t see smoke out the cap, your doing good…. Please see my post from October 21. The wood I use is dried under old tin roofing and is elevated off the ground on runners for two years prior to burning. In other words, the wood is seasoned. I have tested it with a moisture meter before and it is well within the desired range. Huffing and boom problems still persisted prior to cleaning out the secondary burn chamber. In my experience these stoves must be burned hot for best results. There is a hole the size of a quarter in my burn chamber where the styrofoamesque material degenerated. The chamber is not ideal in this condition, but it is still able to process off gases at least reasonably well. At over a $100.00 a whack to replace the burn chamber, I will continue to use it in the state it is in. I do agree with your thoughts on smoke outside and the engagement of the secondary burn chamber. When operating correctly (must be burned hot to engage the secondary burn system and with significant coal base for ideal results) there should be (and is) in my case little to no smoke. I will be tearing into my Oakwood after this cold snap passes. I have not had the extreme issues described. A thorough inspection and cleaning will soon be performed. Last tear down showed deterioration of the combustion pkg. I expect to replace it this time. This Oakwood was installed in basement in 2009, replacing a VC . chimney is masonry construction with continuous 7 inch ss liner thru the center of 70’s ranch house. typically burning Oak and Maple. The maple seems to leave alot more ash than the oak. I burn hot in the evenings and choke it down at night. The stove operates 24/7 from October to april. I frequently use a cresote reducing product by RUTLAND in liquid and solid form. SS liner is brushed twice during the burning season. So far, I have replaced the andirons and warped grate. I now leave the damper/diverter closed when emptying the ash pan. The bottom of the ash draw is still warped upward. I will knock that down and the pan will slide better. Replaced the top loading door after I snapped a hinge. Initally, the damper door would frequently open by itself during the night shutdown. The lock mechanism was faulty, replaced and adjusted-fixed. Thanks again for the detailed info. Thanks for your history Steve P. I leave the ash pan full, to prevent further warping. Our damper door too falls open on its own. I’ve tried adjusting the nut but it falls again eventually so we just use a short bungee cord. I too find the maples turns to ash more so that any other. I also have the same issue with the damper handle, and we have tried to adjust the nut to no avail. Now we use a long handle fire poker propped up at an angle in between our chimney and damper to make sure the door doesn’t open on its own, which used to happen (very scary potential when you are not home or are asleep). I too have experienced the damper door opening on its own in what I would consider high wind conditions from day one (2006) with the Harman Oakwood. What a dangerous over fire condition! I, like you Justin, depend on a mechanical external solution to prevent this from happening. So everyone using a Harman Oakwood, please be very wary of that damper control design. This is very very tragic news. We had high wind conditions this weekend and the damper blew open. We use a bungy cord to keep it closed. We no longer fill the stove and let it burn while we are away or over night. The latest now is I will put wood in at 9pm and we are usually in bed by 10:30. The stove normally burns out by 3am. I checked today to see if the Massachusetts Fire Marshall had any further info on the source of the fire. 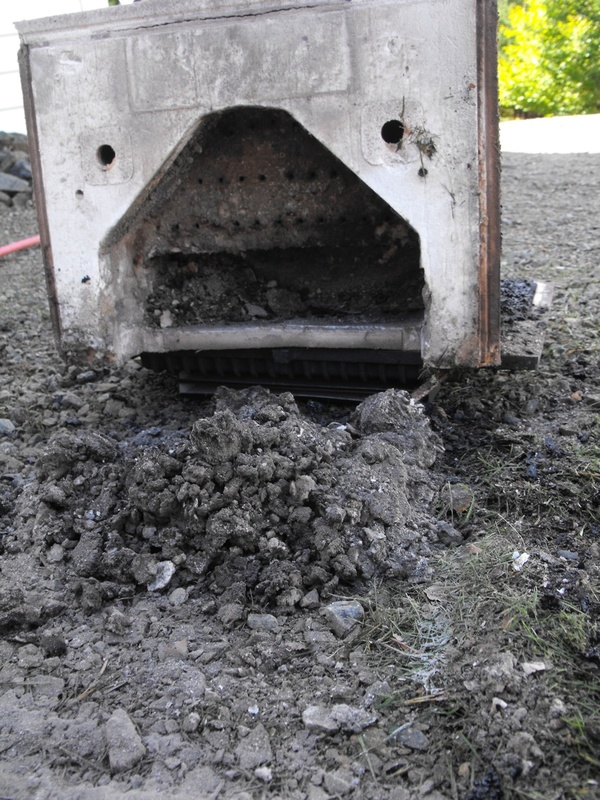 In the process of looking, a close up photo of the wood stove appeared on http://boston.cbslocal.com in a posting that described the night of the fire as windy. Your conversation string on Harman Oakwood stoves is the most useful, informative source I have found. 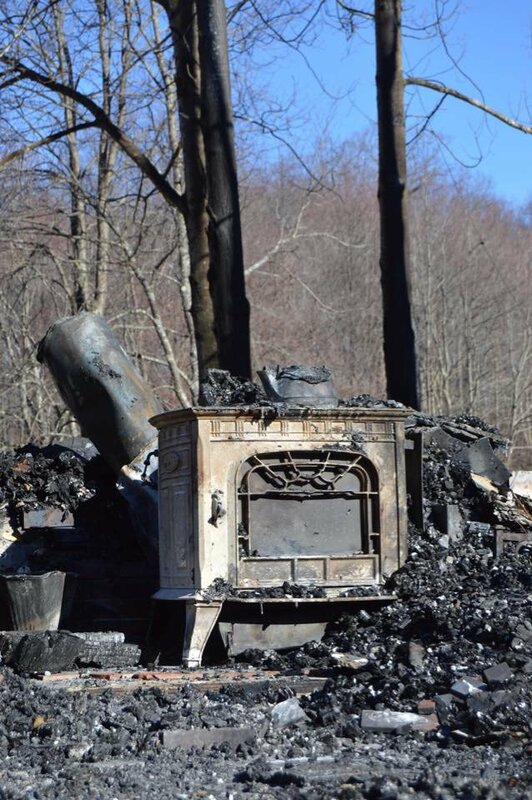 Hopefully stove owners will read and heed all your shared experience. p.s. I tried to paste the photo in this reply but could only include the perishable link. Would you please consider adding the photo linked above to the string so that future stove owners will be able to see it after it is gone from the linked website? Yesterday, I contacted the MA Fire Investigation office about our experiences with Oakwood damper bypass doors. I emailed the responding investigator the link to this discussion string for reference. I expect that there is an investigator’s fire scene photo with a much better angle from which to judge the control handle position. I can’t say with certainty from the one photo, just that it appears to be in the open position at the time of the photo. I’m sure the fire marshall will determine their primary scene. What you have to also consider regarding the damper position is whether or not it was knocked open (fire hose pressure for example). I’m certainly not defending the company that makes the stove, they have poorly designed product in my personal opinion, but I don’t think from a litigious standpoint that you want to point fingers at the cause of the fire without proper investigation and information. I agree with your assessment. I will remain a very cautious wood burner as long as my damper bypass functions the way it does. Hopefully the investigators will be able to definitively determine something useful in this scenario that will help prevent future such loss of life. And if it does turn out to be actually somehow related to the damper bypass operation of the pictured Oakwood, we will find out and be able to modify our practices according to our risk tolerance. Glad that I have found this site!! I purchased a Harman TL 2.0 at the end of last heating season. So altogether, with last season and this season, I only have about 4 months of burn time on my stove. I’m very happy with the stove so far and am thankful that I have not had any of the issues described above. The dealer that I purchased the stove from was very helpfull and honest. He did tell me that prior to purchasing the stove that I would need to clean the combustion chamber after each heating season. He said the that the combustion chamber will need to be replaced about every 6 to 7 years. I will keep you all posted if I run into any problems. Thanks!! Welcome aboard Jeremie. Nice to hear you have had no issues so far. Christmas Day, 2013, just after dishing out pumpkin pie and settling down in front of the telly: Harman wood-oil furnace starts belching smoke with “little” explosions. Great way to end the day. Our model isn’t the same as yours, but our problem is much the same. We’ve had this issue in the past but never as bad as last night. It was terrifying. Thank you for this site — I’m going to read it thoroughly and think twice before I fire up that furnace again. If anyone else out there has the same furnace and this problem, I’d like to have their input here. Sorry to hear about your troubles. Been there… not fun at all. I’ve never heard of a wood/oil Harman furnace. If the unit has a secondary chamber, most likely that will be your problem. The stove pipe looks like it’s upside down. Male ends are supposed to point toward the stove. That keeps dripping creosote inside the pipe. While true, the pipe is installed as it was by WETT installer. Its a double wall pipe so maybe the inside is the reverse. I’ll check when the chimney gets cleaned next time. One other thought… is your OAK installed on the leeward side of the house? If that’s the case, the negative pressure might be periodically reversing the draft. That’s not the situation here. The problem was the secondary chamber was totally plugged. The stove is burning ok now. Jim, you linked to my thread over at hearth.com regarding cleaning the afterburner. Like you, I originally discovered how this piece works by removing the back of the stove and trying to figure out why it was full of ash. Number 4 here is of course not so straightforward, and requires lots of trial and error on how best to adjust the air, when to shut the bypass, etc. There is not just one “right” way to run the stove, but it can be hard to find the best one for your own particular setup without a frustrating learning curve. I invite anyone with any problems, on these or any other stoves, to visit hearth.com. Just go the the forums and start a new thread (or send a PM) – dozens of other stove owners are happy to share their years of experience, and you will be amazed at what you can learn there! The service here is free of course, and its a heckuva lot better than you’ll get from most dealers and especially from manufacturers (with the exception of Woodstock and maybe a few others). These “downdraft” stoves with the rear burn chamber require more time and patience (and money!) to get them running well and keep them that way, but they CAN be made to work smoothly, and are great heaters when they do. Best of luck to everyone, and thanks for sharing your experiences, Jim. How has your Harman been handling with the recent excessive cold snaps we have been experiencing? Its been burning well. Much of the wood we had split is small so the stove is burning through it pretty quick. How about you? Putting the wood to the fire and the wood pile has taken a mighty hit of late! I am hoping any burns you have done of late are running smoothly. We are expecting frost tonight, and I will be lighting a fire, and SLOWLY shutting it down to avoid huffing. I will be facing another season with the Harman, but I am armed with way more knowledge about how to properly operate this stove than ever before. I am feeling confident! I haven’t burned yet this year. Last week we cleaned the chimney and the afterburner in the stove. The chimney was in fair condition. The afterburner box was in relatively good shape with about 2 cups of creosote taken out of it. Never cleaned the TL-300 after burner after four seasons….never told I HAD to. The manual never mentioned it (??). But It certainly SHOULD have ! This is an unforgivable fault of Harman. It got so bad last season, I couldn’t get the afterburner to function at all without frequent booms and wuffing. Early spring fires were mainly all “up-draft”. However, we got hardly ANY creosote in the chimney. This may be due to the fact that before we installed the TL-300, I lined the chimney with an SS flexible liner AND a poured in water/vermiculite/mortar mix called “Safe House” or something like that. The only place there was any significant creosote was in the three inch liner extension that sticks above the insulation. I am quite impressed with THAT aspect of it all. However, my question now that I HAVE pulled the back off the stove and “cleaned” the combustion chamber etc., is where can I get some of that weird gasket material Harman uses for that thing? When I pulled the afterburner, some of the gasket material tore and fell apart. If I can replaced it, I plan to buy an new chamber, but re-install the old one which looks terrible, but is still more-or-less intact except for the gasketing. Also, I would also NOT recommend using a very powerful shop-vac to clean it. That dried owl-poop they use to make the chamber is extremely delicate and can easily be damaged with too much suction. I wonder why they chose THAT stuff anyway. Surely a similar functioning chamber could have been made of something more durable, like conventional fire brick material. “dried owl poop” LOL, that’s pretty close to the description of how fragile the material is. I don’t know what it is, asbestos would be my guess. I never use a vacuum to clean the chamber. I bring it outdoors near the workshop and use compressed air on low, wearing eye protection and a respirator. When you go to buy a new chamber, be sitting down. They are expensive. You could contact Harman for gasket material or check your local hardware store/fireplace reseller to see if they might have something similar. Mine has fallen apart too when I pull off the back plate but I just stick it back on. I haven’t seen any leakage. When it comes to fireplaces and chambers, for insurance purposes and liability, I would stick to OEM materials. Doing a little internet research, it seems that the gastet materinal is called “Interam” or “Interram” and is sold in 2″ & 3″ widths at around $3 – $4 per foot. It is billed as catalytic convertor gasket, but I found the name in a description of the 3-4-06999 CP that “includes the interram gasket” . Thanks for stopping by. Scary wasn’t it when the stove blows up like that? Your experience is typical as the rest of us. “Long burns”. Yeah, right. Not likely. Anybody reading this and thinking of buying one, ask them to define “long burn”. At what temp, for how long? For me, I’ve always had issues with getting the fire to say at a proper heat (400-600F). There’s always the yo-yo effect of bringing it up to heat, then closing the damper (side lever) and then play with the draft (front slider). No matter what, the fire always goes cool (350 F or a little less). Having said that, each year when we clean the pipe and stove, there’s usually just enough creosote to fill a 2L (1/2 gallon) container. Not bad I think. I don’t leave the house (or go to sleep) unless I’ve had the stove burning for a couple hours. That way I know the stove and chimney are up to temp, or has at least cycled through temp a couple times. And I never load teh stove before going to bed (or leaving the house) anymore. I simply don’t trust the stove anymore. Back to your question about the cold outside air. The front slider when all the way to the left is considered in the ‘closed” position. But, according to my dealer, even in that position the draft is still open 25%. To completely shut it off requires the homeowner to install a in-pipe damper somewhere in the intake line leading from the stove to the outdoors. The manufacturer does not allow “complete close” because the fact the stove is so airtight, doing so could create a fire hazard by not allowing proper air flow necessary for such an air tight stove. Again, that’s what I’m told. Makes sense though. I am well into the burning season now where I live and I used my stove for about a month before deciding I couldn’t get through another year without cleaning out the ‘fire dome’ secondary burn chamber in the back of the stove. As we all know, this has to be a priority on the maintenance list from year to year or else we end up with huffing, smoke in the house, and BOOM! I took the rear of the stove apart as I have done each year since we made the discovery of the need for clean-out. I knew my ‘fire dome’ secondary burn chamber was in rough shape (it was the original) so I am always extra cautious about handing it for fear the cheap material will give way and fall apart. Surprise! – it totally disintegrated! With the new ‘fire dome’ this stove is operating like a dream. Of course I bring it up to temperature before shutting it down and I am burning dry wood etc. It is able to keep and hold a non-creosote forming temperature AND I can damp down the air intake lever in the front of the stove all the way down where I could never ever do this before unless I wanted a smokefest. This is a miracle with this stove! I am in totally new territory. Jim, was this how your stove originally operated 6 years ago? (now 7 years). I can’t believe they get away with charging as much as they do for this ‘fire dome’ unit but they do. Good luck and remember burning a wood stove should not be this complicated… but then again… you bought a Harman. Doh! Hi, I bought mine new. So it burned ok for a while until year 5 and 6 (I think) when we had all the trouble. Again, attributed to not knowing about cleaning the secondary chamber. I wouldn’t expect the secondary chambers to last forever. If you can get 5 yrs out it with having to handle it each year for inspection, you’re doing good I think. I’m a retired baker and for many years we operated rotating ovens powered by propane. 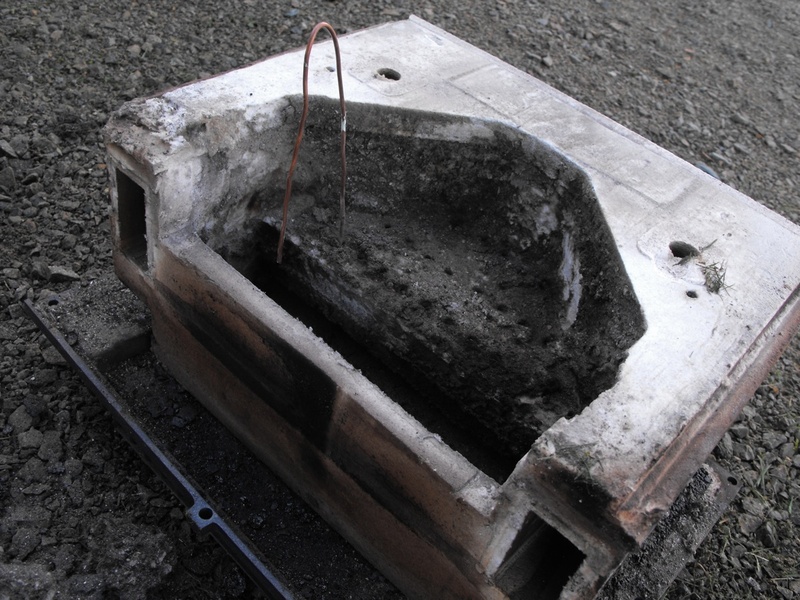 The fireboxes were made of similar material (wear a mask when near one). They only have a certain shelf life. My secondary chamber has a crack in it and a few worn spots (just from handling). So I figure in 2-3 yrs I’ll have to replace it. Or sell it and get something else. If you sell it, you will passing along the smoke headache to someone else. Maybe. Depends on their install location I guess. I don’t know what picture you are refering to. 9 holes? Are you talking about this picture? Does your set-up have an air intake kit like Jim’s up above in earlier posts? That is, is it the black piece of metal, pre-bent to fit the underside of the back of the Harman Oakwood stove with the 4 inch duct which is the intake pipe? The reason I ask is if your draft is so good, you probably don’t need the extra air from outside plumbed into your firebox. You may be wearing our your ‘fire combustion dome’ prematurely as a result. Just a thought. Regarding the ‘shoe brick’ as you called it, I cannot see anything wrong with the alignment/placement of Jim’s brick. I believe you are referring to the firebrick that sits just in front of the ‘fire combustion dome’ and lives at the rear of the firebox which covers a lower portal in the stove and sits in a seat above this opening. This other portal has its own gasket etc. His ‘shoe brick’ is facing the firebox and looks exactly like mine and every other I have seen ( 2 other friends’ stoves). Hoping for clarification on your end. Thanks! I read about all the comments on this site. Fascinating. Burning wood should not be a complicated science nor a constant experiment. Having to wait for certain temps. to be obtained, shutting things down to quickly and you have problems. No, not right. This stove is not designed properly. 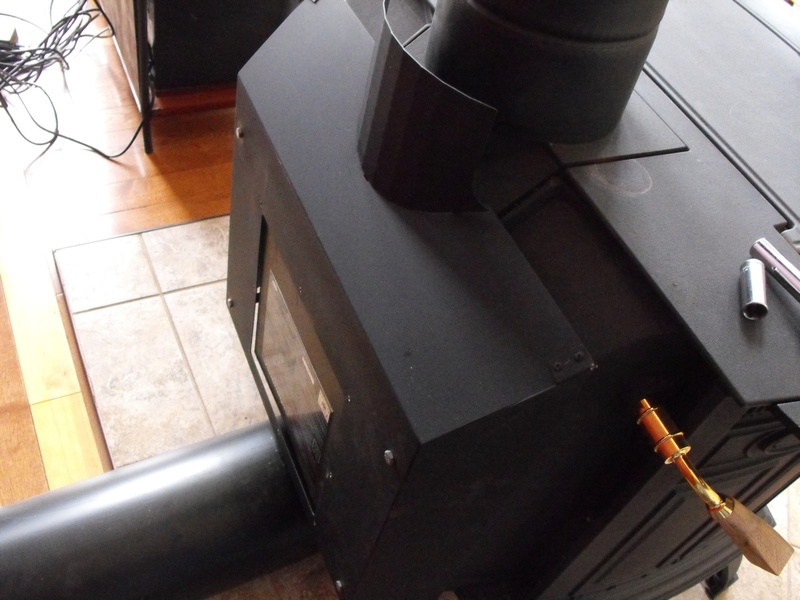 Any air tight wood stove should have only one control and that is how much air you let in. Period. Never shut down the chimney draft. What is the point of trying to maintain a chimney temperature? If the chimney is cool and the room is hot do you open the stove to heat the chimney and heat the room hotter? What do you do if you go away for 7 hours? I have been heating with wood for over 25 years. If I get smoke coming out my chimney seams when I open the door then I know the chimney needs cleaning, it is not drafting properly. As in your one picture showing smoke coming out the chimney seams, the stove is burning but the chimney is not clearing the smoke. The chimney is not drafting properly. I think you have two problems. 1. this stove is wrong, way wrong. 2. poor drafting. Sealing the seams will not cure the problem. To me it is an excellent warning to clean the chimney, however, it the chimney is clean, get that draft test done. A certified chimney sweep should be able to do it. In the old days if the stove smoked with a clean chimney you make the chimney higher. My first step would be your chimney. There should be enough draft, when the chimney is warm (not even hot) to pull every bit of smoke out of the chimney. Chimney was clean at that time of the smoke issue. Draft test was done by certified WETT. Conclusion, add a spinner cap. Which I did. Still had problems. For me, it was ONLY after discovering the secondary burn chamber was not clean, that the problem was found. Since the manufacturer’s installation/user guide did not include that information… I blame the manufacturer. Since then, the secondary chamber gets cleaned annually, and the stove burns ok. Having said that, I no longer trust wood stoves. This one, or any one for that matter. I still use the stove, but ONLY with an abundance of caution. Thanks for stopping by and for your comments. Maybe if the Harman manufacturer had the balls to step up and do a thorough review of this installation, and assembly of the stove including the secondary chamber, maybe they could of put their finger on the problem. If what you say is correct, maybe the stove was not put together correctly upon assembly. My handling of the chamber in the above photos was my first time. So any evidence of air flow performance would of been the result of manufacturer or dealer assembly. I have the oakwood which I installed in 2009 and have been quite satisfied with its performance. I burn from November to Apr and the fire is kept going 24/7 for that period. I must admit that I do have creosote issues and have to clean 2 x a year. My house is 1400 sq ft on 1 floor and I have a large overhead ceiling fan which pushes out the heat to the rest of the house. Except for a few weeks when the outside temps are -10 to -25C I produce too much heat and have to have the stove burning around 300F therefore the creosote buildup. Before reading your blog site I never knew about cleaning out the secondary burn chamber, thank you. Recently we have been getting small explosive puffs from the stove but opening up the air intake to 3/4 has alleviated this issue. My 2 Yorkies are quick to inform me of any puffs of smoke from the explosion. I have watched this as the gases swirl in the main chamber but again opening the air draft gets rid of the issue. I have had quite a few other wood stoves but even though the Harmon is a bit finicky I really like it over all. My main problem is finding dry wood. I am unable to store more than 4 cords so cannot get seasoned wood of 2 years. Mine is 12 to 18 months. I burn oak, maple and birch. I do a hot burn (600F) every morning for a half hour or so in the open position close air to maintain 400F for an hour or two then close for the secondary burn. I have no problem keeping the fire going for 8 to 10 hours. I am on my second grate with a spare in the garage. 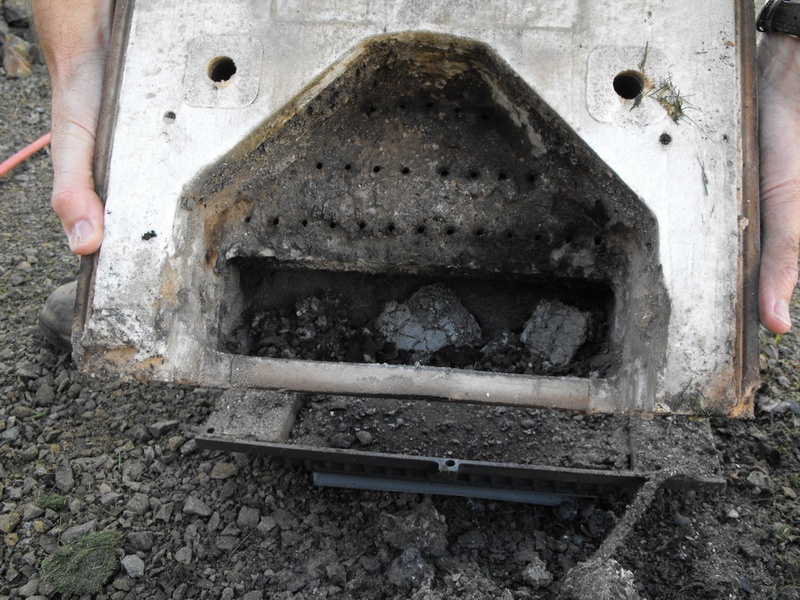 I am cleaning the chimney tomorrow and will definitely open up the secondary burn chamber to see what is there. Thanks again for this excellent source of information. I was just informed that Harman have just bought Vermont Casting. Could you re-describe the process by which you build a fire, close the by-pass, and reduce the air-intake lever on the front and center? It just seems that unless you have 3 hours to devote to building a fire and slowly shutting it down, you will have problems as I have continued to experience even after replacing the entire secondary burn chamber earlier this year. I guess I have too much time on my hands to monitor the fire as I am retired and in and out of house all day to check it. I have found that getting a good hot fire going for at least a half hour (600 F) heats up the cast and burns off the carbon deposit built up from overnight. I then close the air intake to middle position or less and leave it there for a couple of hours adding a couple of more pieces of wood. When there is a good coal bed, add 3 or 4 pieces of wood, close the damper, set the air intake to center and let it burn from 4 to 6 hours. At night, 10 pm add wood and lessen air intake a couple of ticks. That normally takes me through the night and start the process over again. The house temperature is normally 23 to 25C during day decreasing and by morning down to 18 to 19C. I know when I have to clean the chimney when I start getting little puffs of smoke (explosions) which the dogs alert me to. I have decided to install a metal chimney straight up from the stove which will be easier to clean. It is supposed to be installed this week. I hope it does not change the stove performance. I will most likely spring for anew secondary chamber before the fall. Received my 1st cord of this years wood. price jumped from 260 to 300 cord. Apparently there are less woodsmen and higher demand for wood. Your description of burning and room temp is much like ours now. Your firewood is expensive. At that price I hope its blocked, split and well seasoned. I have a heat pump (air source pump), and we still burn 4-5 cord wood during the winter. Hi, I’ve never had to purchase a secondary chamber yet so I can’t say for sure what is included. If you ask the company you buy it from first before ordering, you will know.I will assume when you say ‘flakey stuff’ you are referring to the gasket. It is soft, and then gets brittle over time. Our chimney is straight up. And have not yet cleaned it after this past winter. Will be interesting to see how everything looks. Yes, the new secondary burn chambers come with everything in place. They better for that price tag! We have similar problem, the only way to maintain a good burn (450-500F) is to literally babysit the stove having to open/close the rear damper. Our Harmon Oakwood smokes virtually all the time, so I don’t even factor that into the equation for efficiency. All I consider is the temp of the chimney and how long a loaded stove lasts. Have installed new metal chimney, 9foot double walled join to13 feet of 6 inch stainless Secure 2100 chimney and have seen a marked difference in air draft and stove performance. Previous chimney was 6 feet single wall with 2 90 degree turns into a 12 foot masonary chimney with 6 inch clay liner. Have added a chimney probe thermometer and watching temps of both stove top and chimney flue . After about 1/2 hour with damper in open and air intake at minimum stove top 600, flue 550 F. Gradually flue temp lowered to 425 but stove temp 600. I closed the damper for secondary burn on the first burn, with air intake at centre, stove top temp remained from 600 to 500 but did not have a flue temp. Burn lasted about 6 hours and very little creosote on glass door. No sign of gas explosion or puffs of smoke. I think with a new secondary burn chamber ($512.00 Can),I will get much better performance from the stove . I am happy!!! Posted an image today to this article on the Harman Oakwood fireplace. The fire grate finally burned out. Time to buy a new grate. Yay… It would be nice if they gave you a spare upon initial purchase. How’s the burning season going? I’ve only had a couple fires going so far this year. Stove is burning well. I cleaned the chimney a couple weeks ago. There wasn’t very much creosote from all of last years burn, maybe 2 cups full. I didn’t clean out the secondary chamber this year. Waiting to see how it performs. I figure the less I have to handle it the better. Yep. I hear you on the “handling less” idea. Been lighting a fire consistently once in morning and again at night. Headed into a warmer snap now. 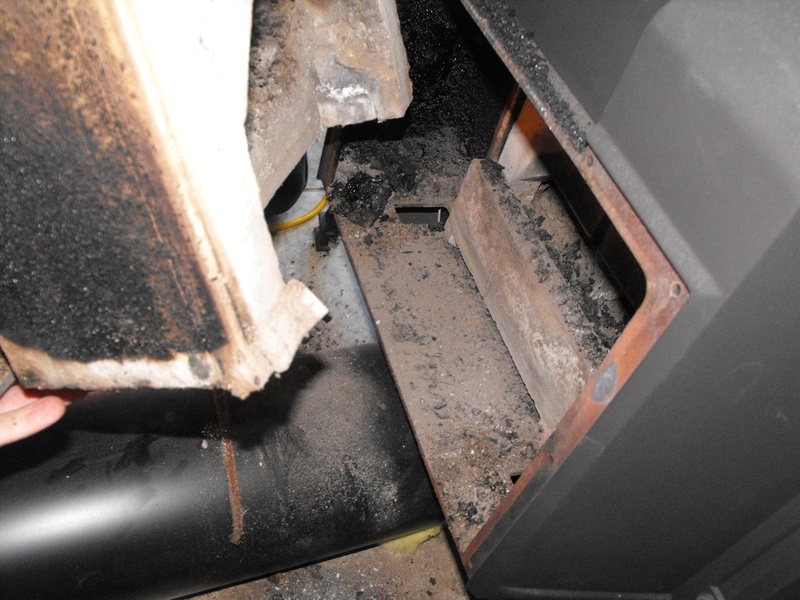 The stove cannot sustain extended non-creosote forming temperatures (according to the pipe and stove top thermostats). Don’t have time to babysit it. Trying not to block the back of the stove in front of the ‘firedome’ chamber with wood when loading. Very difficult, but it is necessary to get the stove to perform at all and not just choke out. There’s a company in the US called ThermoWorks, they make temp probes and gauges. They do make a probe to insert in the chimney and you can set the console display (tethered to the probe by a length of wire) to alarm when the chimney temp gets too cold or too hot. I would of bought one but it would of meant hanging the console on the wall behind the stove. Not a look my wife approved of. I told them they should consider making a wireless console for probes. They took it into consideration but said it probably would not occur any time soon. Too bad. I’d spend $500 on a device that can track of the temps (their probes and consoles have data logging capability) so that I don’t have to baby sit the stove. Cool stuff. I hadn’t heard of them. If I get a chance, I will check them out. Second year of burning with the tl300. First year very smooth after a learning curve. I replaced the single wall with doublewall due to the incredible high temps in the flue when the damper is initially closed. While everthing was torn apart I decided to inspect the burn chamber. Found a split in the base of the afterburner. Gaskets turned to dust as I removed it. Some kind of ceramic material fell off it. Found new gasket material. (This stuff is not easy to find). Started experiencing problems with the AB stalling out. It finally gets cold enough to use the afterburn for extended burns this week. Well I get a nice hot fire close down the damper and this thing sounds like it will take off!! Smoke starts back puffing out the top load door. The doublewall pipe instantly goes from 300ish by magnet thermometer to over 450. Now I know that magnet isnt accurate on the DW pipe but my stove top was 550. Next the thermometer I have on the burn chamber shield goes from 200 to over 600!! In about 3 mins!! This with the airflow completely choked down. I wasnt able to control this thing at all. Please help with any suggestions. Its got me so gunshy right now I dont want to start another hot fire. I’ve had a bit of experience with scary situations like you describe. It was only a month ago I had a situation where the stove dw pipe was at about 550F, which is about where I close the main damper. But my fire kept climbing to over 900F. Panicked, but kept my cool. The only thing I could think of was to open up the stove wide and let the rush of incoming air help cool the chimney. The thermometer kept rising to 950 and was damn near 1000 when I opened the front door. The cold air rushed in, I could hear it. And the chimney promptly started to cool. Friggin scary. Stove’s been ok since. I’ll do it again if I have to. So take that for what its worth. Do you have a magnet thermometer on the burn chamber so you can monitor heat/tell when it kicks in? If so what kind of reading did you get? Did you get a smoke out from more paint burning off the DW pipe? Also is that a reading from a magnet thermometer or probe type? Any experience with pulling the AB and then having issues upon reinstall? That’s what I have, probe type and the magnet keeps it in place. I put in a new one every year. If the paint is burning off, you’re in serious trouble. I’ve been there twice. Its about as close as you want to get to a chimney fire. There’s smoke from the fire itself which can leak out when certain conditions are present, like localized low atmospheric pressure. If you’ve ever seen chimney smoke go downward over the roof of your house rather than upward, that’s evidence of low pressure in your area. The reading I gave were from that temp probe I have installed. I clean the AB chamber every other year, no issues for me after clean other than it performs better. I figure the paint was cureing on the DW pipe as it was new. (Hope so anyhow). Did you replace the gasket material on the face and bottom of the afterburner? My double wall pipe is still the same one I’ve had all along. This year I painted it to touch up all the scratches from the annual cleanings. I still have the original gaskets on my stove. Well I am happy to report that the afterburner is in full effect right now. (after a little anxiety when i threw the damper closed and it started to take off). Jim just wanted you to know that there is a gasket kit that should be used each time the afterburner is removed. The high temp gaskets seem to turn to dust when you pull the afterburner. I have included a link to the gasket set. I have to say, the gasket on mine is in near perfect condition. I’ve read a lot from others who’ve had issues, mine’s ok. Thanks for the link though, good to see there’s a source. Happy to hear you got things worked out. Hello! Your life experience has been helpful! I wish I would have found this before we bought our Harman on a garage sale site. We hAve burned with wood exclusively for years and have a soapstone wood stove which I LOVED. Thing was it wasnt very big, and hubby wanted something that would last all night. There was a TL300 for sale which the man said he only used 3 years then switched to gas (he was older) so I looked up the stove – really only found good stuff about it. So we bought it. But what we didn’t realize was this special combustion thing. I thought it was a normal wood stove with just some weird air flow system. So after more research realized we had to buy a new combustion package. So we did that. $420 later. 1.How do we keep the glass clean?? I thought it has a special air wash system… but the glass seems to get black. 2. How the heck do we use this combustion system?? I have read a lot. And I keep the flue open until very hot around 500 and coals. Shut the flue- keep the air open full. Seems to slow down a lot flame wise… coals slow down but keeps burning with stack around 250-300? So how do I know that the combustion system is working?? 3. Do I need to put in the outside air system? I usually have a window cracked open because it gets warm in here (until super cold temps) but I do notice smoke comes out into the room when putting wood in. Does outside air help with that or help with the glass cleaning? 1.The glass does get black if the fire is not burning at the right temps to burn away the soot. A cool fire will do that. Usually once or twice a year my wife will have enough of the black and put some cleaner on it and scrape it off. 2. The combustion is driven by temperature and the correct mixture of gasses in the fire box. Draft and even atmospheric pressure outdoors, it all plays a roll. Honestly I don’t give the secondary chamber any thought now. After I close the back damper, and the front draft is still wide open, sometimes I hear the chamber “roaring”. The only thing I look at is the temp gauge I have on the flue positioned 18 or so inches above the stove. After loading the stove, when the flue temp gets to about 500-600F, I shut the back damper and slowly adjust the damper over time (like 30 min or so). It depends on what type of wood is in the box and the condition of that wood (softwood/hardwood, dry or still a bit wet). There’s times the draft remains wide open until the box needs to get filled again. And even with the draft wide open, the fire still cools down where the flue temp can drop to 300F. Depends on conditions outdoors, at least for our location. 3. I’d recommend outside air. That way you don’t ever have to be mindful of opening/closing windows. Having that air intake will not prevent smoke from rolling out, and it will not prevent soot build up on the glass. My stove is proof of that. To prevent smoke from rolling up, try opening the door more slowly, allowing the stove to draw in air from the room which should rise up the chimney. 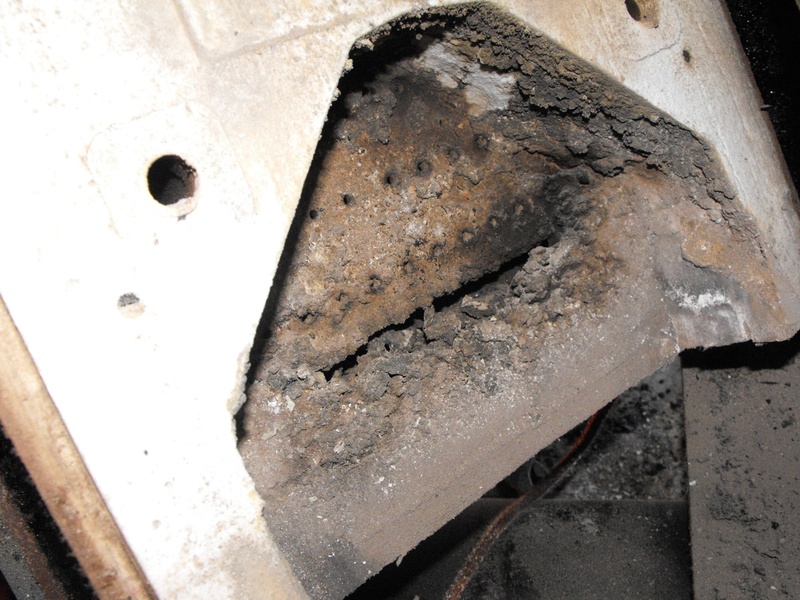 But again, there are factors at play that can prevent good air flow up the chimney. I don’t know the science behind it all other than heat rises, in other words, air will flow from a warm place (indoors) to a cold place (outdoors) but if atmospheric conditions (barometric pressure) is trapping the warm air close to the ground, the smoke will not flow up the chimney as well as it should. Justin had said that replacing his made the stove work like a brand new stove (like it’s supposed to). I sure hope if I replace mine I get better results. Cleaning it didn’t seem to make much of a difference. I get the huge choking off of the fire when I shut my damper. Thanks for all the information, this really has been quite helpful! Hey Jeremy, Yes, you are not crazy. The designers of that stove are. I hear the combustion chamber can run 400-500.00. Worth the peace of mind. Or switch out stoves like you said. Feel free to stop in and add more comments as you like. Everything we as stove users of this brand can contribute, will only help those who run into problems on their own. Hi Rachel, Sorry to hear you had trouble. Based on your description, it is quite similar to others and its in line with the problem we personally experienced. Although we had the air kit installed from the beginning. The air kit will help, but you need to clean out the secondary chamber to make the difference. Then followup up at least once a year with a cleaning. That will depend too on how much wood you burn and how efficiently your stove is burning. Feel free to follow up with your experiences. I’ve been using my Harman for about 2 months now, and the last 5 weeks or so things have gone pretty well (after cleaning out the back of my stove). I still get mild back-puffing from time to time, so I wanted to describe our specific situation and what has helped us with it. When I say “mild back-puffing”, what I mean is that all of the sudden we’ll hear the “whuff” noise and see a plume of smoke arise from our stove. Nothing very violent, no doors being blown off or anything even close to that. It seems to happen when we rush things along too quickly as we’re getting the fire going. Specifically, when we start to add bigger pieces, we still have the damper open to promote the transitioning of those pieces from phase 1 burning (flaming), to phase 2 burning (glowing). That’s oversimplifying it, but hopefully you know what I mean. When we shut the damper too early, when the wood hasn’t fully transitioned to phase 2, we typically observe the temperature in the stove dropping rapidly and once it gets below about 400 degrees, that’s when it starts to back-puff. So we simply open the damper again for 3-5 minutes, which ignites the flames again, and that lets the wood finish transitioning. If you pay attention for a few days, you can learn to visually see that wood is “ready” or not. Using this visual cue as far as when to shut the damper has really helped us reduce back-puffing occurrences. We typically have none now. One additional thing that has greatly helped us was the addition of a stove top thermometer. We got the little magnetic one and stuck it on the top-loading door of our stove. We use that in conjunction with visual cues to know when to open/shut the damper. As we’re getting the fire going, the damper stays open usually until the point at which we have large wood on, that’s well transitioned to phase 2, and this usually happens as the temperature reaches about 600 degrees. We are very careful not to let the fire get too hot (over 650) so as to avoid dangerous situations, so even if the wood isn’t fully caught, we will shut the damper when it hits 650, wait 5-10 minutes as things cool off a bit, then open it again to let the wood continue to transition. It generally takes just a few additional minutes for the wood to fully catch, but the stove is in a safe temperature range while it’s doing so now that we let it cool down just a bit. Once we get the wood transitioned, and the temp up to around 600 or so, we close the damper and typically enjoy a couple of hours of well-sustained heat coming from the stove. Eventually, once it gets down around 400 again (below that is too cold), we’ll open the damper and add wood, starting the process over. I know there are a TON of comments above on this page, so I’m not sure if anyone else covered this or not, but this has really been the ticket for us to be able to use the stove safely and effectively: watching that temperature gauge, and ensuring that the wood has fully transitioned before we close the damper and let it go for a while. We pretty much don’t use the air control thing on the front – doesn’t seem to make a big difference for us. Also, a great tip for getting your fire started from coals or scratch: when you’re trying to catch the kindling and get your wood burning, open the ash door just an inch or two and the increased airflow will greatly increase your heat/flames. I NEVER walk away from this though until I have closed it again, and it usually only takes 2-3 minutes of it being open for everything to catch, then I shut it and let the rest of the stove do its thing. Hope that helps someone. Thanks again to Jim for allowing us all a space to come and converse. Hi Jeremy, Welcome, and thank you for sharing your experience. What you have commented on is pretty much what we do as well. The exceptions being we don’t use the ash door/tray at all. The grate burned out in the first year, probably do to a low quality steel. So the advice from a long time wood burner was to never use the ash pan, rather, just burn your wood as normal and scoop out the ashes from the fireplace as necessary. We usually let it fill 1-2 inches before cleaning. Always careful though to not left ash and coals obstruction the rear intake. And yes, about 600ºF is a good place to be, for us its hard to keep it there. We seem to hover around 500ºF. A couple weeks back we forget the damper was open after refilling and it shot up to 1400ºF. Scary. As for your draft control, we find it to be very effective, so I suggest you diagnose your stove to make sure the draft bar is not disconnected underneath. As that can happen when installing the unit. Thanks to Jeremy for the new comments and insight. Yes- it is true that the process to make a fire and/or add wood is unnecessarily convoluted and requires too much TIME! However, if you have 30 minutes or more to devote to this process, you can usually avoid puffing etc. With busy schedules, work, and life- this is not always possible. Invariably, and almost always- when we get puffing it is because we close things down too quickly. This is usually because a.) we have to leave in the morning to go to work or b.) it is late and we want to go to bed (without sitting up to babysit the stove all night). Agree, closing too soon is the root cause. We never leave the house with a fire on to go, unless is just burning down to coals. As for bed time, I fill the stove a full hour before going to bed to give it time to settle in (and to last longer through the night). Lately we still have to get up after just falling to sleep, as the bedroom is only 8 ft from the stove. So we can hear it tick-tick-tick which indicates a rapid change in temperature. Which does not necessarily raise concern unless the glass is reflecting a lot of flames across the darkened living room. If we see that, one or both of us get up to see what’s happening. We’re just getting into the cooler weather now, hovering around 0ºC, so if that behaviour continues we either will have to load it sooner or let it burn down as bed time approaches. That will mean letting the heat pump kick in overnight, which will will drive up the elec bill but will bring some peace of mind. After about four years of use, my Harmon Oakwood Woodburing Stove exploded. All of the firebricks in the burn chamber were cracked. So, I bought replacements and when I removed the old bricks, I discovered ashes were blocking the air passage behind the Shoe Brick. I removed all of the old bricks, cleaned and then installed the new bricks. That was three years ago and there have been no more explosions. I now remove all of the bricks each fall before the heating season and clean any ashes behind the Shoe Brick. However this year when I turn the “after-burn” chamber on, I smell smoke in my house. I have concluded the “After- Burn Chamber” needs replaced. My stove is about 7 years old. I am in the process of trying to find out how to do the job myself. The store where I bought the stove will not tell me how to do the job and Harman will not provide instructions for a do-it-yourself homeowner. Of course, the place where I bought the stove wants $75/hour. Nice racket. Pictures I posted September 30, 2013 show some of the process. Take off the heat shield , then take off the back plate. The rear of the chamber might be stuck to the back plate, if that happens, just pull the whole thing out. Not hard at all. You can do it yourself if you are able to swap out the bricks. Been a long time since I posted here, but here is my update. One of the wood holder “chess pieces” (for lack of a better term). which keeps the wood away from the class finally cracked off last night! So cheap! Have picture- but can’t figure out how to post! Hi, Thanks for the information. At this time pictures cannot be posted to the comments section.